Labor time cards when : This option allows you to choose the order status at which part usage cards will be created. Equipment time cards when : This option allows you to choose the order status at which equipment time cards will be created. Material time cards based on Estimated when : This option allows you to choose the order status at which material time cards are based on Estimated. Do not create if any material usage cards exists. If this option is selected, a material usage card will not be created when an order is changed to a Built status. Freight parts based on Estimated when :This option allows you to choose the order status at which freight parts are based on Estimated. 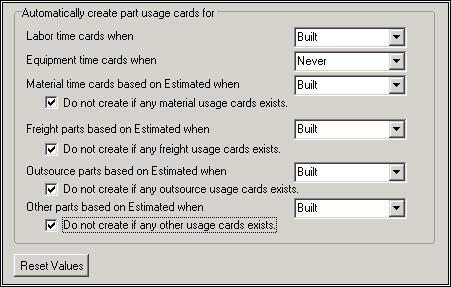 Do not create if any freight usage cards exists. If this option is selected, a freight usage card will not be created when an order is changed to a Built status. 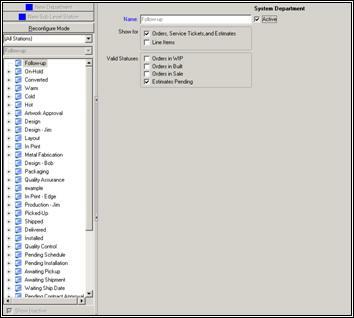 Outsource parts based on Estimated when :This option allows you to choose the order status at which outsource parts are based on Estimated. Do not create if any outsource usage cards exists. If this option is selected, an outsource usage card will not be created when an order is changed to a Built status. Other parts based on Estimated when :This option allows you to choose the order status at which other parts are based on Estimated. Do not create if any other usage cards exists. If this option is selected, other usage cards will not be created when an order is changed to a Built status. New Department button: This button allows you to create new departments. New Sub-Level Station button: This button allows you to create new sub-level stations under any department. Reconfigure Mode button: By clicking on this button, you will enter the reconfiguration mode, which will allow you to reconfigure your stations. Name: [ text entry ]. This box shows the name of the station that you have highlighted on the left of the screen. Active. If this option is selected, it makes the current station active. If it's not selected, the current station will be considered inactive. Orders, Service Tickets, and Estimates. When this option is selected, the station you have selected will be shown on all orders, service tickets, and estimates. Line Items. When this option is selected, your selected station will be shown on all line items. Orders in WIP. When this option is selected, the current station will be a valid status for all orders in WIP. If this option is not selected, it will not be a valid status for orders in WIP. Orders in Built. When this option is selected, the current station will be a valid status for all orders in Built. If this option is not selected, it will not be a valid status for orders in Built. Orders in Sale. When this option is selected, the current station will be a valid status for all orders in Sale. If this option is not selected, it will not be a valid status for orders in Sale. Estimates Pending. When this option is selected, the current station will be a valid status for all Estimates pending. If this option is not selected, it will not be a valid status for Estimates pending. Show Inactive. If this option is selected, all stations, active and inactive, will be shown. If this option is not selected, only the active stations will appear. Automatically Deduct for Lunch. If this option is selected, time for lunch will be automatically deducted. If this option is not selected, time will not be automatically deducted. After hours, include minutes of lunch time. (NOT included if manually clocks in/out for lunch). This option allows you to set times for lunch to be deducted. The first scroll box allows you to set lunch time to be deducted after a certain number of hours. The second scroll box allows you to set a number of minutes long that lunch will be. For example, if you select 5 in the first scroll box and 30 in the second scroll box, it will read: After 5 hours, include 30 minutes of lunch time. Minimum clock in time: . This option allows you to set a minimum clock in time. Maximum clock out time: . This option allows you to set a maximum clock out time. Require a password to Clock in/out. If this option is selected, a password will be required to clock in or out. If this option is not selected, you will be able to clock in and out without a password. Require a password to change time clock status. If this option is selected, a password will be required to change time clock statuses. If this option is not selected, you will be able to change time clock statuses without a password. Allow entry of additional information when changing time clock status. When this option is selected, you will employees will be able to enter additional information when they change their time clock status. If this option is not selected, additional information will not be allowed. Automatically assign line items to employees clocked on job. If this option is selected, line items will be automatically assigned to employees that are clocked in on the job. If this option is not selected, line items will not be automatically assigned. Default weeks of history displayed in time clock: . This option allows you to select a number of weeks to be displayed in the time clock history.